This is my go-to Chocolate Cupcake recipe. End of. 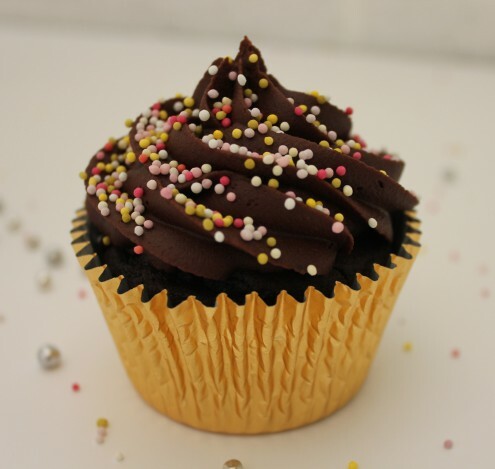 Whether you are Vegan / Dairy-Free / Egg-Free or not, this is a deliciously chocolatey and moist cupcake that lasts beautifully. I have attached two Vegan Buttercream options for this cupcake but this can be topped with a Cream Cheese Frosting or any dairy buttercream if you are not catering to special dietary requirements. Add cider vinegar to soy milk in a jug, whisk briefly until combined and set aside for a few minutes. The milk should thicken slightly. Sift your flour, cocoa, baking powder, bicarb and salt into a separate bowl, add the caster sugar, and stir to combine. Add sunflower oil and vanilla extract to your soy milk mixture and whisk to combine. Pour your wet ingredients into your dry ingredients and stir gently until everything is incorporated into a thick, glossy batter. Divide your cupcake batter between 12 cupcake cases in a muffin tin. You may need to use a jug to pour this mixture as it is very liquid and hard to spoon! Bake for 15 minutes, or until the cupcakes have risen and are springy to the touch. Allow to cool completely on a wire rack.